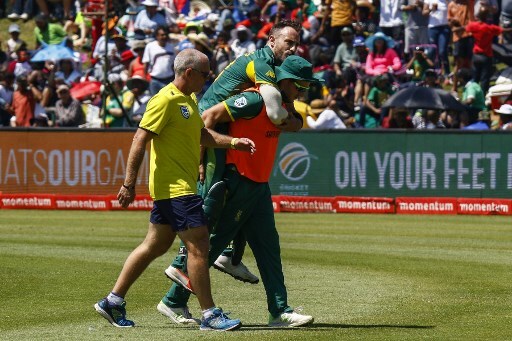 Faf du Plessis had to be piggybacked off the field with a serious back strain last weekend. Photo: Michael Sheehan/AFP. The Proteas skipper might only just recover in time for the day-night Test against Zimbabwe in late December as T20 series take stage. The painful back problem Faf du Plessis suffered while batting in the third and final ODI against Bangladesh has been confirmed as a disc injury which will keep the Proteas captain out of action for six weeks, Cricket South Africa announced. “Faf consulted with our team of specialists in Cape Town on Monday. Further investigations and assessments have confirmed an acute lumbar disc injury. He will require a period of rest and rehabilitation for the next six weeks. We anticipate him to be ready for the Test match against Zimbabwe in December,” said Mohammed Moosajee, the team manager and doctor. It had already been decided that South Africa will go into the two-match T20 series against Bangladesh, which starts in Bloemfontein on Thursday, without Du Plessis, with JP Duminy being given the responsibility as captain. Bloemfontein usually does not boast the greenest of pitches, so batting-friendly conditions are almost assured, which means the Proteas will probably try and load their side with bowlers who can bat. They could go so far as to play both Andile Phehlukwayo and Robbie Frylinck. Frylinck would be making his international debut at the ripe old age of 33 and he is clear about what his role would be in the team. “Our batting line-up is phenomenal so we will have to see if I get a hit. I think I could have a vital role with both bat and ball, but I’ll probably be used more for my bowling. But I can do a job with the bat as well. It’s a boundaries game after all. “With the ball, it’s about hitting the areas I want to hit and then if the batsmen play good shots they get boundaries, but if they play bad shots then we get wickets. You have to be skilful in T20 and espe- cially here at altitude where the pitch has played beautifully for the last few weeks. We expect a high-scoring game,” Frylinck said. Although it will be Frylinck’s first international match, he has ample T20 experience, having played 87 games, including stints in the IPL, England and the Caribbean Premier League. “Each game has its own pressures, but this one will have a bit more. You get to the stage when you think maybe it’s not meant to be in terms of international cricket, but I know my game and at this stage of my career I’m not really trying things, I just stick to the basics and do what I know I can do well,” Frylinck said.